In 1834 a young Bowdoin College professor wrote to the U.S. Senator from Maine, Peleg Sprague, looking for a favor (two favors, actually). He was hoping that Sprague could assist his very talented friend, George Cooke, in obtaining a commission to paint one of the four vacant panels in the Rotunda of the Capitol in Washington, DC. He also hoped that Sprague could help him in obtaining the Modern Language professorship at the University of Virginia. Sadly, George Cooke was not tapped to contribute to the paintings in the Capitol. Instead, these commissions went to John Vanderlyn (Landing of Columbus), William Powell (Discovery of Mississippi), John Chapman (Baptism of Pocohontas), and Robert Weir (Embarkation of the Pilgrims). George Cooke (1793-1849) did go on, however, to become a distiguished American painter under that patronage of the industrialist, Daniel Pratt. His most famous work is the Interior of St. Peter’s in Rome currently on display at the University of Georgia. And the Bowdoin College professor? Well, Sprague apparently was not much help there either. The young man ended up teaching at Harvard, publishing a few poems and translating some Italian. His name was Henry Wadsworth Longfellow. I must apologize for troubling you with a letter at a time when you are so much engaged, as at the present moment. I certainly should not do so, were it not in behalf of a friend, and upon business which, in a certain sense, is of a public nature. I see by the papers that four American artists are to be employed to execute paintings upon national subjects for four vacant panels in the Rotunda of the Capitol. A very intimate friend of mine, Mr. George Cooke of New York, is very desirous of this opportunity to distinguish himself. He already enjoys a high reputation as a portrait and landscape painter, and I have every reason to believe that he will become equally celebrated in historic painting. I passed nearly a year with Mr. Cooke in Italy, and I can bear witness to his ardent and assiduous application in his profession. He passed, I think, four years in Europe and returns home full of zeal and enthusiasm for his art, and burning to distinguish himself by some great work. His age cannot be far from thirty-five so that he is in his prime – a man of fine powers and long experience. His style of painting is exceedingly finished and beautiful, and his coloring very excellent. I believe our Representative is one of the Committee, to whom this subject is referred. If you should have leisure to speak with him, I must beg of you to mention Mr. Cooke as a man who would not be likely to disappoint the expectations of the Committee. Will you excuse me, Sir, if having thus far pleaded the cause of my friend, I take the liberty of asking a favor for myself? From reasons which I need not mention, I have become desirous of leaving Brunswick. My ardent desire is to obtain an appointment as Secretary of Legation in some foreign Embassy; but this I suppose is impossible at the present moment. I have no friends in power under the present Administration, though I hope hereafter to procure such a situation. En attendant a gentlemen from Virginia – a friend who is much interested in my success in life – informs me that in all probability I should be able to procure the professorship of “Mod Lang” in the University of V[irginia]. I have requested Mr. Cooke, who is acquainted with Mr. Rivers, Senator from Va. to write to him upon the subject, to see if there is a vacancy. If you will ask Mr. Rivers (who is one of the Gov. of the University) what the state of the institution is, and what the salaries, or prerequisites of the professors are you will do me a great favor. I hope, Sir, you will not think I have presumed too far in this letter. I should not have written were the subject of much importance to me and I will request you, in conclusion, not to put yourself to any inconvenience in these matters, but let them wait you leisure. The letter can be found in the Peleg Sprague Collection. On a spring day in 1822 young Olive Wadsworth married her distant cousin, Ahira Wadsworth, in Bristol, RI. Both the bride and groom hailed from Duxbury so it is a bit of a mystery as to why they chose to marry out of state but perhaps Ahira, a merchant, had reason to be in that port. Olive was 20 years younger than her new husband and must have felt a bit daunted at the prospect of entering his house, already the home of his children by his first wife, Deborah Sprague, who had died nine years earlier. The house to which she entered was a lovely two story Colonial located on Washington Street. It was large and elegant with eight rooms and intricately carved woodwork. The house was used for both living quarters and as a store. Life must have been fine for Olive until five years into her marriage when Ahira went bankrupt. The Wadsworth’s property was seized and sold off. The house was sold to Capt. Martin Waterman and much of the adjoining land bought by Benjamin Holmes. The following are the bounds of the Dower of Olive Wadsworth in all the real estate of Rufus Holmes of Duxbury, as agreed upon by the parties Sept. 17th 1867. To wit. Begin at the NW corner of Andrew Stetson’s garden in George Partridge’s line; thence, in said line, N 75 1/2 W about forty rods to the corner, then S 12 W, as the fence now runs, Eleven rods & five links to a post & stake, then S 75 1/2 E to a stake by the said Stetson’s garden fence, then by said fence N 12 E eleven rods & five links to the first bound. And said Holmes is to have a right to enter upon said Dower land to remove, for his own use, all the growing crops, now thereon, and shall furnish a convenient way to said Dower land, to said Olive, if he objects to her passing over his rye now growing on the same. Ten years later, in 1877, Olive sold off the rights to her small holding to Rufus Holmes for the sum of $25. Martin Waterman’s widow’s agreement was much more severe. According to former Duxbury Town Historian, Dorothy Wentworth, “Lydia Waterman, widow of Martin, had to share her home of 40 years with Olive Wadsworth, widow of Ahira.” The house was literally split in two by an imaginary line running down the center of the house. It is uncertain whether Olive ever took up residence – one hopes not! Olive lived a long, and we hope somewhat happy life. She and Ahira had six children: Harriet, Henry, Horace, Helen, Hamilton and Harrison. She clearly liked the letter “H” (Ahira’s six children by his first wife have no such naming scheme). Three of her children, unfortunately, died young. In her widowed years she lived with her son, Hamilton, who was a shoemaker. Her exact death date is uncertain, but she was still “keeping house” at the age of 83 in the 1880 US Census. The above transcribed Dower description and the real estate deeds of the Holmes family were recently donated to the Drew Archival Library by Arthur Beane. Henry A. 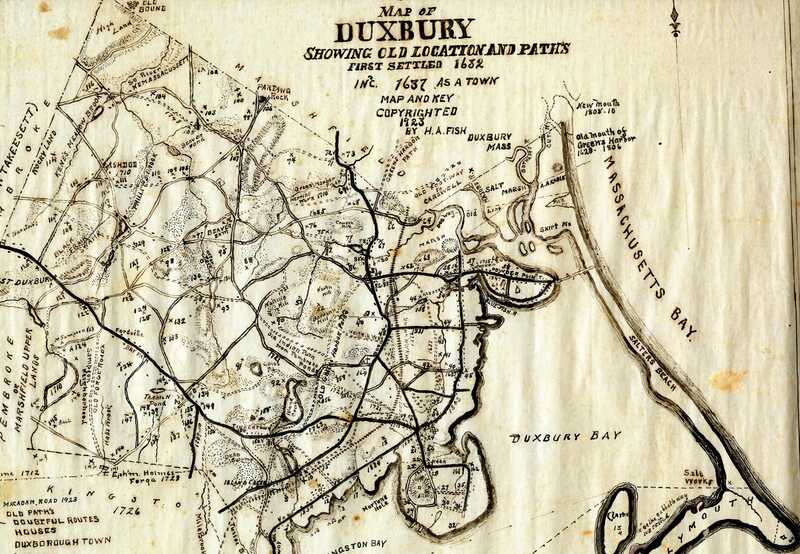 Fish is not a name that comes immediately to mind when thinking about Duxbury history, but it should. His unpublished “Notes” as well as his published booklet entitled Duxbury Massachusetts Ancient and Modern: A Sketch with Map and Key (1923) are quite possibly the most used items in the Drew Archives. He was born in 1853 in New Ipswich and married Alice Carson in 1880. The couple settled in Duxbury, living in the Prior Farm house on Depot Street. The house was in a perfect location for Henry, who worked for the nearby Old Colony Railroad. For a time he supplemented his income by making brooms and brushes and sold farm equipment. He also dabbled in photography. During his later years, however, he became too ill to work. While his wife, Alice, took in boarders to pay the bills, Henry filled his days researching local history. It is my understanding that Alice was completely unaware of what he was doing and was rather surprised to see the published pamphlets arrive at the back door. I refer almost everyone who comes to the Archives to the “Fish Notes” and “Fish Map.” While there are certainly errors that have been pointed out by historians over the years, the overall work is quite impressive and very comprehensive. He was lucky enough to live at time when many of the “cellar holes” of the original Duxbury settlers were still visible. His map carefully plots out where each cellar hole was located and to whom it belonged. For those decendents and genealogists looking for where exactly their ancestors lived, the map and key are invaluable. So, here’s to you Henry, and thanks! In 1820 young William (1811-1858) and Edward Ellison (1813-1866) of Boston tragically lost both of their parents and two of their siblings to “spotted fever” (possibly typhus). Their older brother, James, while greatly concerned with their wellfare, was ill-equipped to care for the boys. Luckily, William and Edward were part of a much larger family consisting of numerous aunts, uncles and grandparents. One such aunt was Sarah Alden (Hickling) Bradford, the wife of Capt. Gershom Bradford, living in Duxbury. The Bradfords had four daughters but no sons. An arrangment was made whereby the Ellison boys would be cared for by their aunt Sarah while their room and board would be paid for by their grandmother, Elizabeth Hodson Hickling, possibly out of the estate of their parents. Their legal guardian, however, was a man by the name of Mr. James. By all contemporary accounts both Sarah and Gershom Bradford were the best of folks and most likely cared for their young charges well, even “adopting” Edward. Although, in a letter from elder brother James Ellison, we get the impression that William was a handful. In the Bradford Family Collection we also have Sarah Bradford’s household account book that sheds some light on what it cost to raise and educate her two charges..
Wiliam and Edward to S.B. Paid Dec. 26, 1820. William Ellison married Almeda Partridge of Duxbury in 1834. The couple had three children: Peleg Sprague, who would later change his name to William, (b. 1835) ; Elizabeth H. (b. 1838) and Laura B. (b. 1840). His descendent was William “Bill” Ellison, one of the great benefactors of the town of Duxbury in the 20th century. Edward Ellison moved to Bangor, ME and was involved in the tin trade. He married the widow Lucy Mills Milikin in 1839. The couple had four daughters: Mary, Sarah, Almeda and Helen. WWI through a girl’s eyes. Going to Chin-Chin. Good bye. Went, had a simply corking time. Montgomery & Stone were corking. They had a clown band. Simply great. Grandma enjoyed it greatly. Vera still presists in teasing me. Father has a cold. He gave me a ten dollar gold piece. I have got 152 dollars in the bank. When I put this in I will have $172. Gosh I am sure some rich kid. Be able to buy a tin lizzy soon. Mother is going to Mrs. T’s for a dinner next Wednesday. Phy is coming over here. My dress is getting on. Damn those Germans. The last raid in England they killed almost one hundred people. Mostly women and children. They are planning a new offensive to take Dunkirk and Calais. They won’t get it though. Phy to supper. Got a little cold. Went to bed early. Gee, I could smash those Germans. 10 below this morning. Great fun riding lying down. Awful cold. K. and G went too. Just three of us. Coasted all the afternoon. Slept like a top. The Germans on West Front capturing a few trenches. Nothing new. Grandmother home from New York. Brought me a red Chinese wrapper. Great. Went to school. Bad day. Phy came to supper. Dressed in costume I am going to wear tomorrow night. Germans are still giving it. Kaiser is sending them on to slaughter like pigs. Verdun attack calmed down a little. Went to school. Phy has bought of some of her spring clothes. One of her hats looks awfully well on me. Striped skirts are all in style. Am going to have one suit. Just wait til I get speeded up. I am fifteen years old. Lord Kitchener dead. He was on his way to Russia. The ship was torpedoed in the North Sea. I am afraid this is a very disheartening thing to happen. I never felt this sort of thing but I do now. It seems so awfully queer. There seems to be a black shadow always behind one. The President of China is dead also. This is an awful world. Eleanor’s diary does not continue after a few entries in early June. Perhaps she left her diary her Brookline home when she packed for her summer house on Harrison Street. Perhaps it became lost or she simply lost interest. Whatever the reason, we are glad she wrote her mind for at least a few short months in 1916. To hear Eleanor’s words come alive or hear other WWI letters, join us in the Wright Building on May 20, 2010 at 7pm. The even its free of charge and, as always, refreshments will be served. See you there! 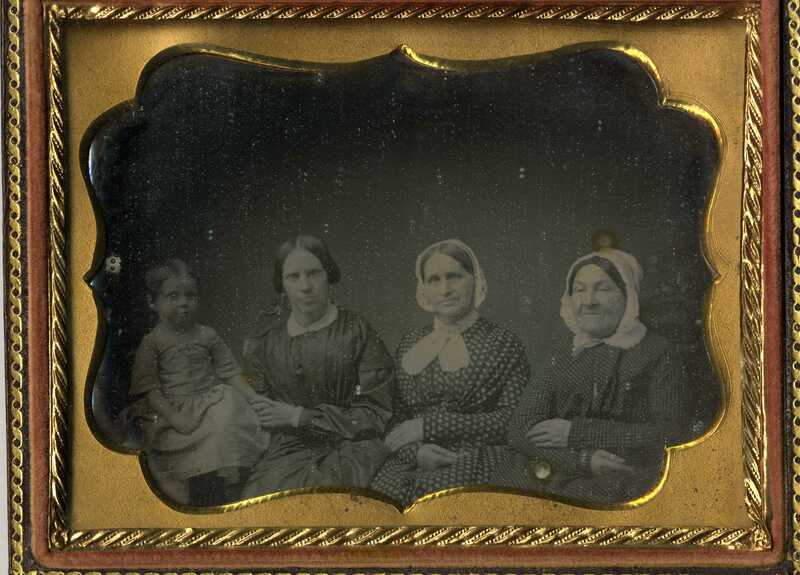 It is not often you come across a daguerrotype depicting four generations. This one is especially fine considering the importance of the women photographed. Starting on the right, we have Judith Winsor Hathaway (1778-1881). The story goes that Judith was such a lovely young woman that the painter/doctor, Rufus Hathaway, fell in love with her at first sight. Next to Judith is her daughter, Polly Hathaway McLauthlin (1796-1879). Polly was married to Lewis McLauthlin, the groundskeeper of Ezra “King Caesar” Weston’s estate. Next is Judith Winsor McLauthlin Smith (1821-1921). She was married to shipbuilder, Sylvanus Smith. Judith was active in political and social causes throughout her life. She was an abolitionist and a suffragette. In 1920, at the age of 100, she was able to cast her first vote. Finally, on the left we have Frances Smith (1849-1916). Like her mother, Frances was a reformer and spent her life working in Boston as a social worker and for many charitable organizations. The photograph is from the Smith McLauthlin Collection.